For those leading change and strategy implementation efforts, facilitating good decision-making is a core responsibility. From the initial decision to undertake a change, to identifying the innovation or solution that will be implemented, to designing the approach and adjusting to new realities during execution, change implementation is full of trade-offs that require quality decision-making. Those of us working in the change space may not hold decision-making authority for all of those decisions. However, we can play a role in supporting others to make better decisions. As such, it’s imperative that we understand how good decisions are made — which is where I often turn to research. Mind you, research on decision-making is wide-ranging. However, if we narrow our focus to small group/team decision-making processes, there are some clear themes about the methods that can make the most difference. What makes for a good decision-making process? Problem analysis: Understand the nature, severity, causes and consequences of the issue, as much as possible. Establishment of evaluation criteria: Set clear standards for an acceptable solution. Develop a range of alternatives to consider: Identify a number of options that are realistic, acceptable and feasible. Assess the positive consequences of each alternative: Develop an awareness of the merits of each option. Assess the negative consequences of each alternative: Develop an awareness of the potential disadvantages of each option. Are some things more important than others? Hirokawa and Orlitzky performed a meta-analysis of studies that investigated the link between the actions outlined in the functional theory and decision effectiveness. Based on this analysis, the action most strongly linked to effective decision-making is identifying the potential negative consequences of the options being considered. Looking at the potential downsides of various alternatives seems to be even more important for complex decisions, where there is no “right” or “wrong” answer (Orlitzky & Hirokawa, 2001). Additionally, this review indicates that problem analysis and development of evaluation criteria are likely important factors in quality decision-making. The review finds that the relative value of brainstorming a range of alternatives is on the lower end. (Keep in mind, other research indicates choosing from a variety of alternatives, rather than a single option, improves decision-making outcomes.) The study’s authors hypothesize that this may be because groups focus more on the quantity than the quality of alternatives generated. Thus the real message may be that we need to focus on generating viable alternatives, not simply aiming to come up with some other options to say we did. Finally, this study found that assessing the positive consequences of alternatives was not highly correlated with decision outcomes. Keep in mind, beyond process there are many contextual factors that can impact decision quality. Things such as the type of decision being made, the interest or commitment of team members in making a decision, access to information, and the capability of the team to effectively evaluate information, just to name a few. Sometimes, the devil is your friend. In addition to the meta-analysis discussed above, there is other research that supports the positive link between methods that force a debate and good decision outcomes (e.g., Schwenk, 1990; Schweiger, 1989). Such methods may link to better decisions because they encourage the group to critically investigate “key assumptions, data, and recommendations...to prevent uncritical acceptance of the seemingly obvious and to tap the knowledge and perspectives of group members” (Schweiger, 1989). It’s worth noting, that some studies have found that, compared to consensus methods that maintain group harmony, those that force debate may be more time-consuming and negatively associated with group experience. However, others have found that once group members become familiar with these "debate processes", they can conduct them with greater efficiency and with limited impact on group member satisfaction (Schweiger, 1989). Put the evidence into practice. For this reason, some groups formalize the role of a devil’s advocate, assigning it to different group members on a rotating basis. This person is tasked with critiquing options or recommendations presented to ensure adequate discussion of assumptions and downsides. Critique ideas and assumptions, not people. Be respectful and assertive, not rude. Be less concerned with convincing others and more concerned with airing alternate views. Reframe questions or ask alternate questions to generate a new angle of discussion. Flag it when the group jumps straight to solutions without clarifying the problem to be solved or investigating assumptions and downsides of the suggested plan of action. The decisions we make during change and strategy implementation can have a big impact on the experience of those working in our organizations. A thoughtful decision-making process won't guarantee great decisions or the ultimate success of the change — but it certainly increases our chances. Herbert, Theodore T., and Ralph W. Estes. "Improving Executive Decisions by Formalizing Dissent: The Corporate Devil's Advocate." The Academy of Management Review 2.4 (1977): 662. Web. Apr. 2017. Find the abstract here. Janis, Irving Lester, and Leon Mann. Decision making: a psychological analysis of conflict, choice, and commitment. New York: The Free Press/Collier Macmillan Publishers, 1979. Print. Macdougall, C., and F. Baum. 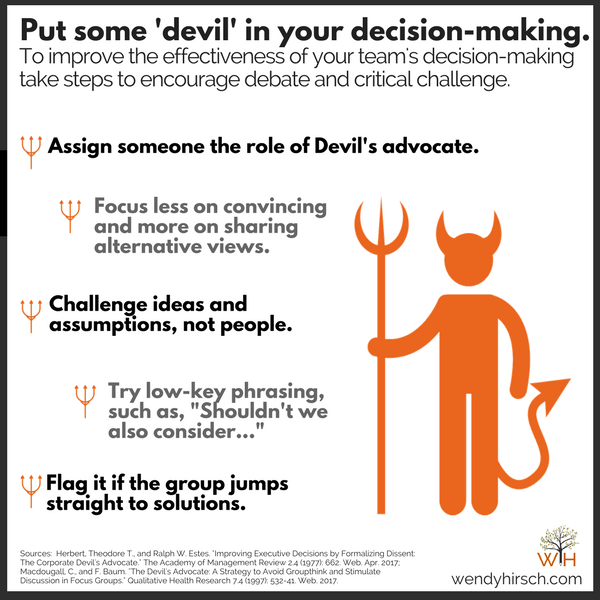 "The Devil's Advocate: A Strategy to Avoid Groupthink and Stimulate Discussion in Focus Groups." Qualitative Health Research 7.4 (1997): 532-41. Web. 2017. Find the article here. Orlitzky, M., and R. Y. Hirokawa. "To Err is Human, to Correct for it Divine: A Meta-Analysis of Research Testing the Functional Theory of Group Decision-Making Effectiveness." Small Group Research 32.3 (2001): 313-41. Web. Find the article here. Schweiger, David M., William R. Sandberg, and Paula L. Rechner. "Experiential Effects of Dialectical Inquiry, Devil's Advocacy and Consensus Approaches to Strategic Decision Making." Academy of Management Journal 32.4 (1989): 745-72. Web. Apr. 2017. Find the abstract here. Schwenk, Charles. "Effects of Devil’s Advocacy and Dialectical Inquiry on Decision Making: A Meta-analysis." Organization and Human Decision Processes 47 (1990): 161-76. Web. Apr. 2017. Find the abstract here.